Oh it’s happening. Big time, people. T-minus one day until Jen’s birthday, and I made her cinnamon rolls! Nope, not even a healthy version. We went all out. Hey, it’s her birthday! She deserves it. YOU deserve it! When Jen told me that cinnamon rolls were her favorite treat, I knew I had to find a way to whip these bad boys up for her. I was surprised at how simple the process actually is! When it comes to making the perfect pastry, I often turn to Sally from Sally’s Baking Addiction. And yep, she did it again. Only the best for my Jen! So, we hope you guys enjoy these buns as much as we do. 1) Begin by making the dough: Set aside 1/2 cup of flour. You may use some or all of it if your dough is too sticky. In a large bowl, toss 2 1/4 cups flour, the sugar, salt, and yeast together until well combined. Set aside. 2) Heat the water, milk, and butter together in the microwave until the butter is melted and the mixture is hot to touch. About 115 degrees. Stir the butter mixture into the flour mixture. Add the egg and only enough of the reserved flour to make a soft dough. You may not use it all. Dough will be ready when it gently pulls away from the side of the bowl and has an elastic consistency. 3) On a lightly floured surface, knead the dough for about 3-4 minutes. Place in a lightly greased bowl (I used non-stick spray) and let rest for about 10 minutes. 4) Make the filling: After 10 minutes, roll the dough out in a 14x8 inch rectangle. Spread the softened butter on top. Mix together the cinnamon and sugar and sprinkle it all over the dough. Add more cinnamon/sugar if desired. Roll up the dough tightly. Cut into 11-12 even pieces and place in a lightly greased 9-inch round pan. 5) Loosely cover the rolls with aluminum foil and allow to rise in a warm, draft-free place for 60-90 minutes. After the rolls have doubled in size, preheat the oven to 375 degrees. Bake for 25-30 minutes until lightly browned. I covered the rolls with aluminum foil after 15 minutes to avoid heavy browning. 6) Make the glaze: Right before serving, top your cinnamon rolls with glaze. Mix the powdered sugar, vanilla and 2 tablespoons milk together until smooth and drizzle over rolls. If it seems too thick, add 1 more tablespoon milk. If you prefer a thicker glaze, add more powdered sugar. *Rolls are best enjoyed the same day, but stay fresh and soft in a covered container at room temperature or in the refrigerator for 5 days. Glaze the rolls immediately before serving. Rolls (with or without glaze) freeze well, up to about 3 months. Thaw in the refrigerator and heat up however you prefer. *Make ahead/overnight: This dough can be made the night before through step 4. Cover with plastic wrap and let rise in the refrigerator overnight. The next morning, remove from the refrigerator and allow to rise at room temperature, about 1 hour. 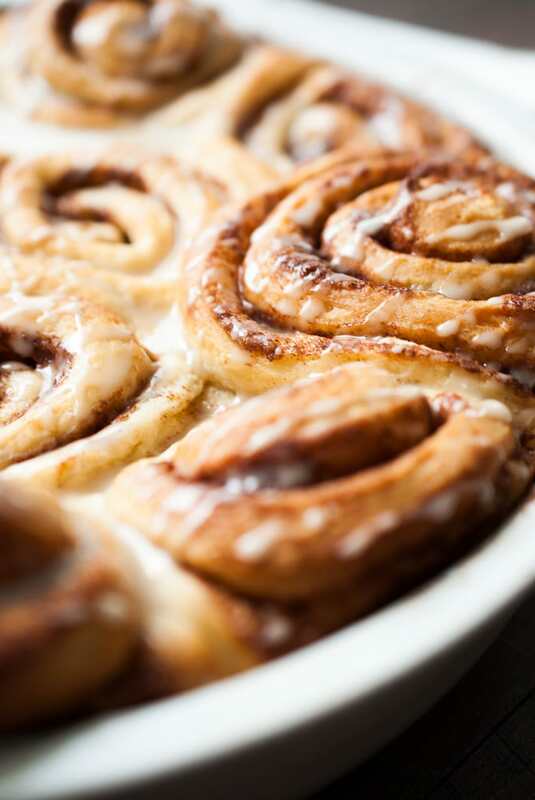 Look delicious, and yes cinnamon buns are only truly brilliant if they are the full fat version!